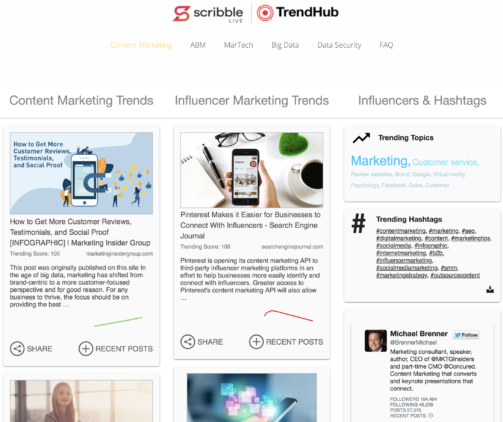 At this year’s Content Marketing World we announced TrendHub—a ScribbleLive solution that provides sales and marketing with predictive trend, industry, market, and content intelligence. After giving demos of TrendHub for the first time at our CMW booth, we compiled our answers to the most burning questions about TrendHub and its many uses within your marketing technology stack. TrendHub is a cloud-based, Artificial Intelligence (AI) powered content and market intelligence solution that provides sales and marketing with predictive trend, industry, market, and content intelligence. Looking for the latest intel on a certain topic or event? Want to monitor what your competitors are posting and sharing, so you can stay ahead of the game? Your use of TrendHub is entirely up to you. 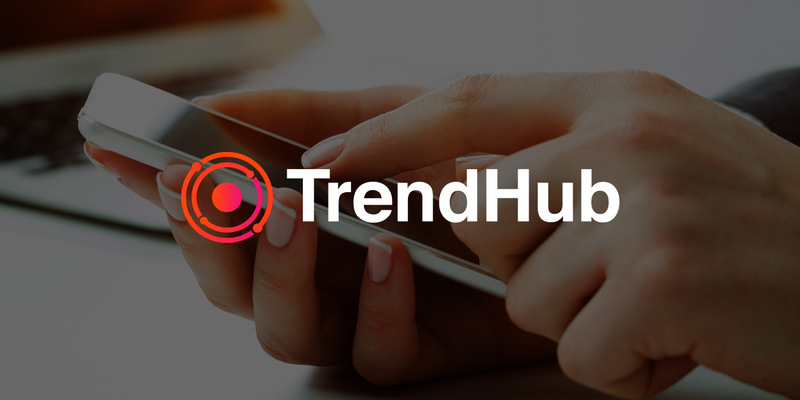 A “TrendHub” consists of three sections, including Content Marketing Trends, Influencer Marketing Trends, and Influencers and Hashtags. You set your own parameters, including which hashtags and topics to track, and AI takes care of the rest, predicting those topics that will have the highest engagement and reach. Once you’re done customizing, you’ll have an embeddable TrendHub that you can place on your site or use as an internal resource. An example of a TrendHub and its 3 columns. What is TrendHub used for? How can Sales use TrendHub? Sales departments thrive on insights. With the help of TrendHub, they can enter a conversation with a prospect fully informed on the latest trends and competitor info. In a world of content overload, tailored messaging is key. When the salesperson has access to the specific topics a prospect may be interested in, the messaging behind the sell becomes much easier, and best of all, much more relevant. How can Marketing use TrendHub? Every marketer wants to stay ahead of the curve and needs predictive intelligence to have a competitive edge. A marketer’s best friend is information, and using tools that can automate the receiving and monitoring of relevant stories and trends is a huge time-saver. This helps with everything from content strategy to event planning to creating specific messaging during a product launch. How does TrendHub fit into the ScribbleLive Content Cloud? We believe that content builds relationships, and launched TrendHub with that in mind. Content performance has become multi-layered, and the market changes on a second-to-second basis. Organizations are faced with the challenge of producing content that connects, all while staying up-to-speed in an ever-evolving industry climate. Trend monitoring can inform sales conversations and content strategy so that engagement tactics are more effective, ultimately attracting audiences with a higher conversion rate. Although consumers may receive an unlimited number of messages in a day, what makes them engage? Asking that question and finding out what consumers care about is at the root of what makes TrendHub work. Can I get a demo of TrendHub? We’re glad you asked. Sign up today to receive a demo from one of our content experts. We’ll also be at MarTech East from October 1-3 in Boston! Meet ScribbleLive at booth 41.